Honeywell Student Innovation Day 2009 on the Stevens Campus! Honeywell Teachers for the 21st Century strengthens teachers’ science content knowledge and pedagogy by preparing them to use online, award-winning curriculum resources developed by the Stevens Center for Innovation in Engineering and Science Education (CIESE). These NJCCCS-aligned curricula engage students in science inquiry, engineering design and problem-solving through use of Internet-based, real-world data and technological design. 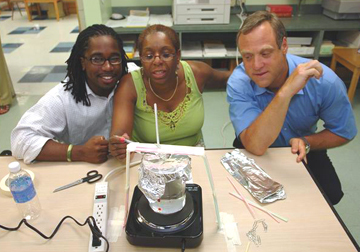 Teachers participate in hands-on science investigations and team-based engineering design activities in life, earth, and physical science. Activities reinforce topics measured by the NJ ASK8. International Boiling Point Project: Students participate in a global experiment to determine which variable has the greatest impact on the temperature at which water boils. Human Genetics: Students gather data from their own classrooms and community, then compare it with thousands of data points to understand dominant and recessive genetic traits, and their prevalence in the population. Musical Plates: Students use real-time earthquake and volcano data from dynamic databases such as the U.S. Geological Survey to explore the relationship among earthquakes, plate tectonics, and volcanoes. Weather Scope: Students design and build instruments that meteorologists use and create a weather learning log to record their findings. © Copyright 2007 - All rights reserved . Stevens Institute of Technology.